Choosing the right navigation app is no easy feat. Some cost a few precious boat bucks just to download, and “free” doesn’t necessarily mean “less” when it comes to features. With the recent news that NOAA will stop printing paper charts this April, iPads are fast replacing chart plotters on the bridge or in the cockpit. As a former cruiser, I often relied on print cruising guides to learn about a new port or cruising area. As we all know, this kind of information is always in flux. And there’s the rub: How do we get the latest information, preferably from other cruisers? The answer: AC. For the past few years ActiveCaptain (AC) has grown and expanded to include over 100,000 boaters who write reviews and updates on anchorages, ports, hazards, facilities and more, all around the world. Sail with confidence with any of the five navigation apps below. They all include ActiveCaptain data as an overlay for members. (AC membership is free). The newest offering in the Apps Store is Skipper and the free version isn’t just a trial; it includes a handy NOAA online chart viewer for onshore planning and satellite imagery on shore. For the Pro version you pay an annual fee of $12/year and you don’t have to pay extra for the charts you’ve already paid the Government for in taxes. NOAA Charts are auto-updated (or choose Google Earth or Topo maps, including historic topos. What fun!). All is cached and displayed offline very seamlessly, except weather and Google Earth requires an online connection. It also does routes/waypoints and real-time navigation (which Garmin’s app doesn’t do). Your subscription syncs your personal data and routes, waypoints, tracks, etc. between your multiple devices. Raster charts (the best!) load fast and look great since they are mosaic-ed together and are only 1.8GB each for the smallest possible download size. Skipper’s creator, Andrew Johnson says that Inland Rivers Charts including all NOAA vector charts will be added soon and he is working on ways to integrate Open Street Map technology. Perhaps my dream of having one app that shows both Charts and Maps may soon become real! Garmin International – Free (Charts are available via in-app purchase and range from $30 -$70). BlueChart uses vector charts with features such as search, routes, waypoints, weather stations (choose conditions overlay showing dew points, temperatures, wind direction and speed, water temp, visibility) GRIB weather with wave heights and period, celestial data, measuring feature, real-time tracking. Each icon gives great details when tapped. Lots of overlay features can clutter up the chart but choosing which ones to view is easy using the cool “radial chart object menu”. The first full resolution, seamless charting iPad app. 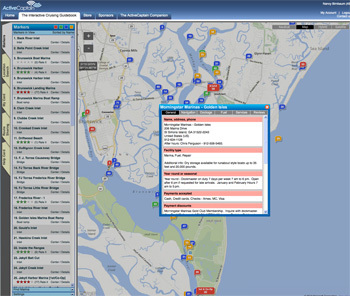 Charts&Tides uses NOAA and CHS vector cartography. Covers all of U.S. and Canada and cost $20-$40. New features include AIS support, Closest Point of Approach (CPA) computations and alerts, more connectivity options for GPS (WiFi, GPSD), new Dead Reckoning Mode and interface improvements. From the folks who brought you affordable PC and MacOS charting. Their PolarView MX app for iPhone or iPad offers both vector and raster chart viewing combined with extensive instrument support that many mariners are seeking. Chart coverage includes U.S. and U.K. and world-wide charts are available. Developed by software engineer/live aboard world cruiser, Mark Hayden. SEAiq uses free NOAA vector charts. Try SEAiq Free first, then upgrade to SEAiq USA or Open for $9.99 with in app purchase to enable all features. SEAiq Open allows you to use your own vector charts. (S-57, S-63, CM93, iENC, BSB, and KAP) or you can purchase charts for anywhere in the world from ChartWorld. Also, with Inland ENC support, you can download hundreds for free charts for many rivers in Europe. Other features: Import/export waypoints and routes. NMEA data, AIS, Track recording, GRIB weather downloads, anchor alarm, instrument data, TCP/IP WiFi NEMA data.